If there’s one thing that takes a beating during pressure washing, it is the pressure washer hose. If it’s not suffering from the impact of being dragged and dropped then it is suffering from the forces of being tagged and twisted. At some point, the beating will become too much and the hose will give in. At this point, you will have to replace it with a brand new hose. With this in mind, we compiled a guide with reviews of the top three hoses available for your pressure washer. This guide also includes other information including the things you should look for when buying one and some of the common mistakes people make that causes damage to their pressure washer hoses. Here are the best hoses for your pressure washer. The Schieffer is a braided high-pressure hose reel that’s designed to handle pressures of up to 3100 PSI on both gas and electric pressure washers. This braided hose measures ¼-inch in diameter and is 50-foot long to provide maximum cleaning reach. Regarding compatibility, the Schieffer is compatible with many pressure washer brands including Generac, Karcher, Ryobi, Briggs, etc. The hose’s smooth thermo-plastic cover provides an impressive burst to operating pressure ratio of 4:1. What’s more, the hose’s interior tube is further reinforced with textile braids to provide maximum strength and durability. The Schieffer also features bend restrictors on both ends to prevent kinks during use. Apart from the Schieffer featured above, you will hardly find a better replacement hose than the Simpson Cleaning 40224. Just like the Schieffer, the 40224 is a medium-duty hose that can handle water pressures of up to 3100 PSI and maximum water temperatures of 140°. The Simpson Cleaning 40224 matches the Schieffer in almost aspects but falls short in some and that is why it is ranked second. For instance, both hoses share the same price point but with the Simpson Cleaning 40224, you get 25-feet less of washing range than the Schieffer. On to the positives, the Simpson Cleaning 40224 hose features MorFlex Technology which uses lightweight polyester braids to provide kink resistance, maximum flexibility and easy handling. Its outside is high-quality polyurethane material that prevents abrasion and marring. 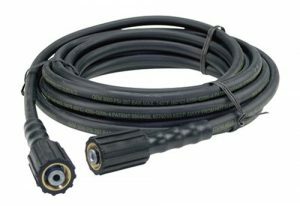 The 40224 hose is designed to fit pressure washers with standard M22 thread connections. Setup of this hose is made easy with the inclusion of 14 and 15mm M22 hose connectors thereby eliminating the need for tools. The Briggs & Stratton replacement hose is the third best in our list. 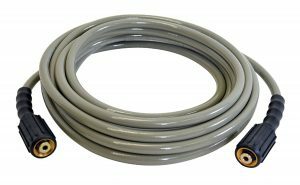 This replacement hose is ideal for light and medium-duty pressure washers. Unlike other hoses which are produced by unknown companies, this hose is a product of Briggs & Stratton, one of the leading pressure washer manufacturers. If you own a Briggs & Stratton washer, this is the ideal replacement hose for your washer. With regards to its build quality and specifications, the Briggs & Stratton replacement hose weighs a paltry 1.91 pounds. Its lightweight nature not only helps with handling but also makes storage extremely easy. As for its dimensions, the Briggs & Stratton replacement hose shares the same dimensions with the Simpson Cleaning 40224 hose featured above. It measures ¼-inch in diameter and 25-foot in length. It also comes with M22 thread connectors at both ends making it compatible with most pressure washers on the market. Pressure washers hoses offer a choice of three diameters to choose from; a ¼-inch, 3/8-inch, and 5/16-inch hose diameters. If you are on the market for a new hose and don’t know which diameter to go for, simply carry your old one to the store for assistance. Most residential-grade pressure washers use hoses with a ¼-inch diameter while commercial and industrial-based washers use hoses with a 3/8-inch diameter. The 3/8-inch diameter hose is the largest and can handle high water transfer rates of powerful washers. Pressure washers that use the 5/16-inch hose diameter are the rarest. The material used to manufacture a hose dictates its flexibility and durability. There are three types of materials used to manufacture hoses, plastic, rubber and polyurethane. Plastic hoses are the cheapest and lightest. They are commonly used in light-duty models. Rubber hoses are more durable than plastic hoses but also cost more. Lastly, polyurethane hoses are the most expensive as they offer a lightweight operation as well as a high-level of flexibility and durability. Pressure washers and their accessories are fitted with two types of connectors, there’s the quick connect type of connection and the threaded M22 connection. Both of which come with male and female connection ends. 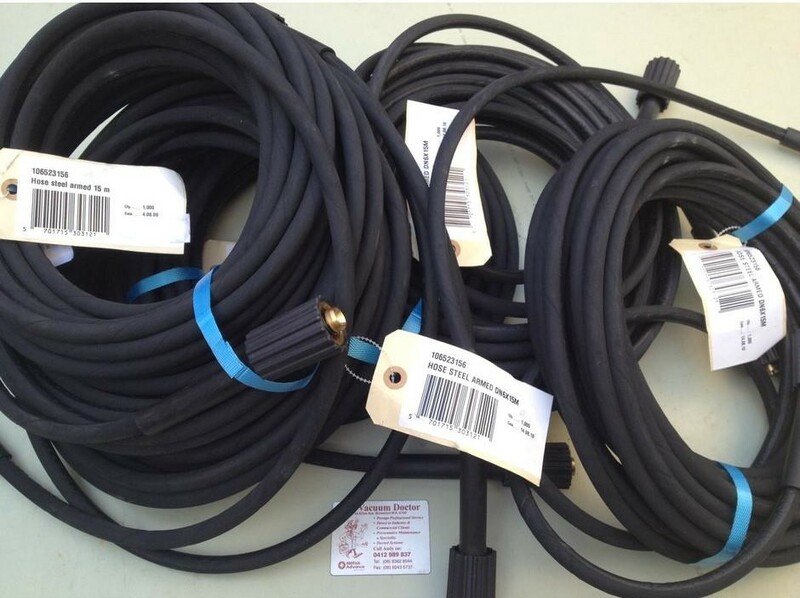 Washer hoses come in three standard sizes; 25, 35 and 50-foot lengths. Simply pick one that meets your needs. If your washer hose happens to blowout near the wand end, check for improper coupling and fix it. When this happens, simply ensure that the hose and all connectors are installed properly. Next, ensure you have configured the hose’s crimp setting accurately. Excessive kinking is one of the major causes of washer hose failure. Strenuous activities such as using the hose to pull the washer can cause excessive strain which then weakens the wire structure within the hose. Flattening is when you drive your car over the hose or place heavy items over the hose. This flattening causes damage to the braids within the hose making it susceptible to a future blowout. This mainly occurs when the hose is empty as there’s no internal pressure to counter the weight of a vehicle or a heavy object placed on it. This is when a hose’s outer material wears out to expose the interior reinforcements to external factors which cause rust and deterioration. The main cause of abrasion is the friction that the hose is subjected to when the user drags it across rough surfaces. When you buy a hose, it normally comes with instructions to provide guidelines on how to use the hose. For instance, most manufacturers indicate the ideal water temperature and pressure ratings to use on the hose. When a hose is subjected to intense pressure and temperature, its interior structure is damaged. An example of this is when you use one hose on different washers that provide different functionalities. Please note that a regular hose should not be used for steam service. Not cleaning your hose after use, not draining the water within the hose and letting your hose sit in pools of water are some example of improper hose care that may lead to its failure. Even if you buy the most expensive heavy-duty pressure washer hose out there, it is inevitable that it will wear down over time and will need replacement. That is why we recommend proper maintenance and care for your hose to prolong its lifespan. Have you heard of Suttner pressure washer hoses. Suttner is one of the longest producers of components, accessories and hoses. They have a hose for all applications. 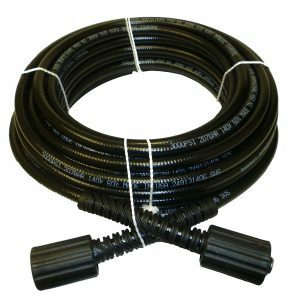 Suttner’s 1/4” 25’ and 50’ textile braided Thermo plastic pressure washer hose has a working pressure rating of 3200 PSI with M22 fittings. I haven’t heard of Suttner till now. But after reading your comment i googled it. What i see is it does not qualify our passing criteria. But will surely in our list if it passes that.